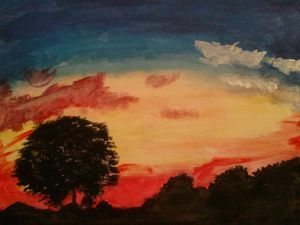 It's a silhouette of a tree and a piece of a mountain, the background consists of a colorful sunset with clouds of two different colors. The clouds are different colors because of the position they are in front of the sunset, one is darker since the light hits it in a different way. It is a painting in which I used different colors to create the colors I needed. It goes from dark blue to light blue to a cream color to yellow which then turns to orange.